Dubbed the ‘Kingdom of Golf', Doral is one of the world's finest comprehensive golf resorts, boasting 4 separate championship courses. One of which, The Blue Monster, was an annual host on the PGA Tour for 53 consecutive years, hosting the World Golf Championships-Cadillac Championship. The magnificent 800-acre resort features villa-style accommodations, exclusive Spa suites, brand new tennis courts, the Royal Palm Pool, on top of multiple luxury event venue options like the Trump Grand Ballroom. This prestigious resort is in a perfect location too, less than 20 minutes away from the Miami International airport, and 30 minutes away from the stunning South Beach to relax and soak in some sun rays. Already renowned the world over and rich with history, the famous Blue Monster at Trump National Doral is tougher, significantly longer, and more dramatic than ever before. Restored to its past grandeur in mid-2014 thanks to the vision of golf course architect Gil Hanse, meticulously re-sculpting every hole. The 7,590 yard course features a series of strategically placed deep bunkers, long flowing fairways, interesting undulating greens, deep Bermuda rough and a challenging assortment of water hazards – all of which combine for a course that requires both length and finesse to score well. The famous 18th hole is traditionally ranked as one of the most difficult on the PGA Tour. Because of this is it no surprise that it has held multiple World Golf Championships events. 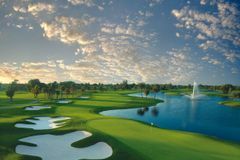 Doral's Gold Course is used for the PGA Tour Qualifying School, and was recently reworked by PGA Tour legend Raymond Floyd. Water is prevalent throughout the Gold, with no less than 15 greens protected by the dreaded aqua. The signature hole is saved for last; the closing par 4 features an island green that demands steely nerves and pinpoint accuracy. The Red Course is seen as a course for everyone, but it should not be underestimated - the talented women of the LPGA Tour converged upon the Red for the 2001 Office Depot Championship. Water comes into play on 14 holes, most acutely around the island greens of the 6th and 14th, the most special holes on this thoroughly enjoyable test. The Silver Course, while littered with the archetypal Doral water, is distinctly different to its neighbours; designer Jerry Pate signalled a departure from the classic Florida style by devising narrow fairways, with holes of varied length to create an interesting and diverse challenge. Now in its 17th season, the Jim McLean golf school at Doral is widely recognised as the number 1 tuition facility in the United States, offering state-of-the-art expert tuition under the directorship of the esteemed McLean. If your swing needs some fine tuning, head for the golf academy, directed by Jim McLean, one of the world's most revered golf tutors. Understated sophistication is the theme that drives the luxury Doral resort, where the accommodation is comprised of intimate clustered lodges. Light wood furniture and finishings underpin the elegant units, which are complete with deluxe en-suite bathrooms, private balconies or terraces, plantation shutters, high speed internet access and the finest bedding and linen. For added luxury, upgrade to one of the 48 exclusive Doral Spa Suites, where the Tuscan style complements the high end features like wet bars and jacuzzis. The excellently equipped rooms are sure to provide all the comfort and convenience required for a memorable stay, allowing you to concentrate on tackling Doral's magnificent golfing options. Guests can choose from over 100 different health and beauty treatments at the fantastic European inspired Spa, which also includes a state-of-the-art fitness and exercise suite. For children aged 5-12, Camp Doral will guarantee a fantastic holiday thanks to the endless list of activities and the dedicated team of helpers that entertain them. The Doral tennis complex features 7 championship courts, while the Blue Lagoon is an amazing network of pools, slides and whirlpools, providing fun for all the family in the Florida sun. The Windows on the Green dining room serves cuisine inspired by the flavours of South Florida and the Caribbean, overlooking the final green on the Blue Monster. Of the four other restaurants, the Champions Bar and Grill comes highly recommended, with a hearty menu aimed at golfers emerging victorious from the course. Doral's conference and meeting facility boasts over 40 purpose built rooms, amassing more than 90,000 sq. feet of space.